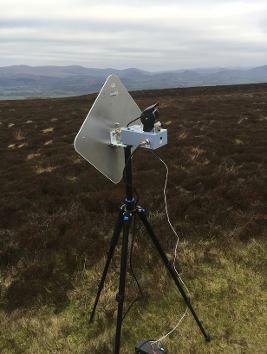 My main ATV station is not suitable for portable operation from any remote sites; all sites need to be close to the car as the kit is too heavy and bulky to carry for any substantial distance – it’s fine for up a small hill or a short distance from the car. But I wanted something I could take to higher / more remote locations which are not accessible by car. I decided to build a ‘stripped down’, portable ATV station that was capable of being fitted into a rucksack and carried for long distances by foot. To achieve this it would be necessary to sacrifice some features used in the main ATV station in order to keep the weight and size down - such as a higher quality camera, speakers for RX audio, AV recorder, test card generator and I’d use 1 panel antenna instead of 2. This would mean manually connecting and disconnection the RX and TX units as required – not quite as smooth as my main station with 2 antennas – but not a major hardship. As I wanted to keep everything as small (and lightweight) as possible I gave a lot of thought on how best to achieve this. First was the RX side. Obviously, a receiver unit and monitor is required and instead of using the separate receiver and monitor (which added more cables and power requirements) as per my main ATV station, I looked for an alternative solution. There were two… an Android device (phone or tablet) and RX unit, or a FPV receiver monitor. As I’m an ‘Apple’ guy and don’t have any Android devices I decided to purchase a ‘FlySight Black Pearl FPV monitor’ which has a built in 5.6GHz receiver. This is the updated long range version of the Flysight Black Pearl FPV monitor with a 40 channel 5.8GHz receiver. The long range version uses better filtering techniques to improve the range over the standard Black Pearl monitor. 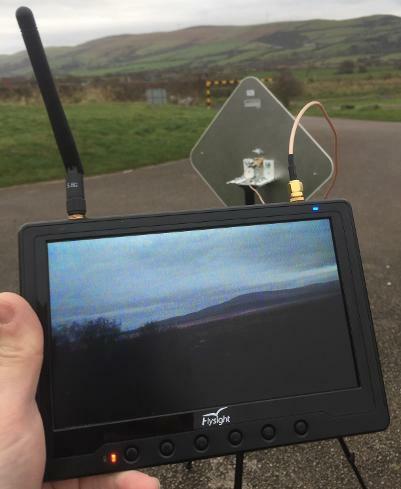 The dual diversity receiver on this Flysight Monitor automatically detects which antenna is getting the best signal to give you the best possible FPV reception. This Black Pearl monitor is ideal for those who want a FPV system that is quick to setup and easy to transport while still giving you the best possible FPV reception. Because the battery of the FlySight monitor is built-in you don't need to worry about lots of wires or batteries to power each individual part. The built-in 5.8Ghz Diversity receiver will always ensure you get the best video signal and also allows you to use two different antennas. The other great feature is the integrated battery, so you don't need to carry extra batteries just for your monitor. Supports Airwave and NextWave transmitters and many others on 5.8Ghz due to the 32Channel diversity receiver. This essentially gave me the RX side of the portable station all in one – it even has its own internal battery meaning it cut down on the number of leads. However, I have made up a power lead to run from an external 12 battery in case it is needed whilst out portable. All I need to do connect connect to the antenna and I was ready to go. And with having 2 antenna sockets it means I can use the supplied ‘rubber duck’ antenna to monitor my own TX signal. Now on to the TX side of the portable kit – this is all very similar to my main ATV station, but with all the following parts in one case so it’s very much ‘plug and play’: TX module, On Screen Display module, camera, and AUX AV input with a switch to choose which input is used. The TX module is slightly different from the ones on the main ATV station. They are essentially the same, but I have found these to be slightly more reliable from an output power perspective. A chassis mount N Type (female) to SMA (female) was fitted to the top of a plastic case 15cm X 9cm X 5mm, and using an SMA RP adaptor the transmit unit was connected directly to this. The TX unit it held firmly in place by this chassis connector, and some heat sink was glued to the back of the TX unit to help dissipate some heat whilst in operation. 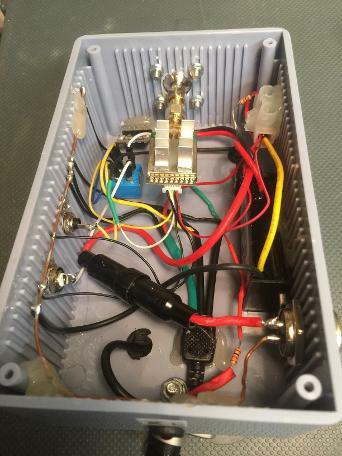 A 12V input was fitted to the case with all 12V modules connected to it, with an ON-OFF switch which acts as a main TX switch. 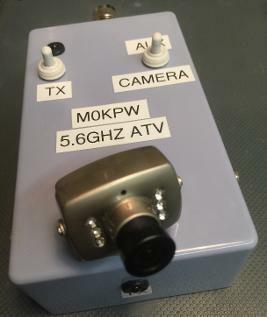 I was not adding a test card generator to the portable kit, however I wanted to ensure I was able to transmit my callsign and other information over the video signal. After building the main ATV station I discovered there was a lightweight (around 1g in weight) Onscreen Display Module that is indented for drone use (transmitting flight data such as altitude etc.) that could be programmed to display any text of choice – this was added as a retrofit to the main system – and I wanted to use one on this new build. The unit in question is a ‘MinimOsd Minim Mini OSD On Screen Display with KV TEAM MOD for CC3D FC FPV RC’. They are very simple to use, just solder power wires direct to the board, as well as Video IN and Video OUT and Ground wires; you also need to solder the programming pins to the board. The board is very small so be careful with the soldering iron ! The module does need programming with the information you want to display – the module needs to be programmed line by line, but if you’re only displaying a few lines it’s not too complicated. Details on how to do this are available at various online sources so I’ll not ‘reinvent the wheel’ by detailing it here, but in summary you need some Arduino programming software and then a osdprepcode.zip file from the CQ-DATV download page and other sites. In the file is a PDF file with entitled FONTSHOWTO.pdf which tells you how to upload the new font file. The OSD module needs 5V power, and as I wanted to keep everything contained in one unit I bought a 12V to 5V step down unit. You can easily build a required board to step the voltage down, but I opted for a commercial unit. The OSD module is held firmly in place to the plastic case using some hot melt glue. The output signal from the OSD module goes via an ON-OFF-ON switch to allow the onscreen display to be superimposed over the camera which is attached to the transmit unit or the video AUX socket for use with an external camera. A small 12V colour camera was attached to the case and hard wired into the unit so it has a ‘built in’ video source, the quality of this camera isn’t great, but is more than suitable for a portable set up. As mentioned above the addition of AUX audio / video sockets allows for an alternative / better quality camera to be used should the need arise. 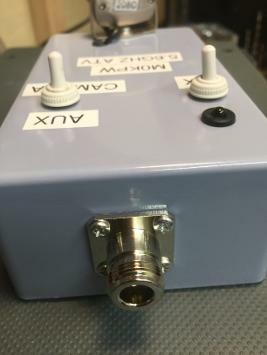 One of the panel antennas from my main ATV station is used for this portable kit. I decided to use the Gibeon antenna (for no other reason than it was the easiest to take off the main station!) and I attached this to a lightweight camera tripod that folds up small enough to fit in a rucksack. 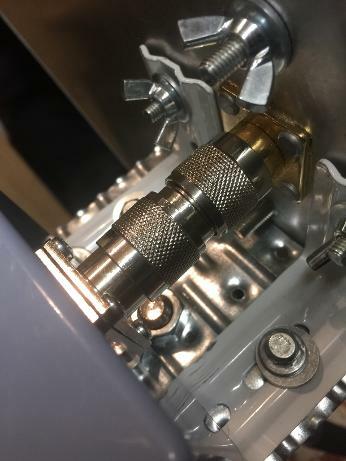 An N Type female socket had been fitted to the TX unit, so an N Type male to N Type male adaptor is used to connect the unit directly to the antenna – this cuts down on using coax and introducing any losses. 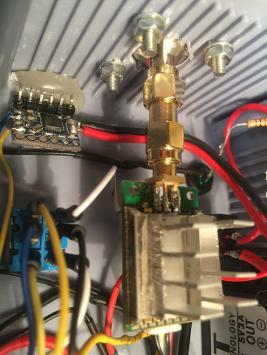 But the TX unit can be connected to the antenna via coax if required, and coax is used for connecting the RX monitor. Short lengths of both RG8 and 5D-FB (See below) were cut, and fitted with N Type connectors – after some field tests no significant losses are noticed when using these cables. The loss of 5D-FB is 0.54dB/meter at 5.8GHz, compared to 0.91dB/meter for RG213 at 5.8GHz. 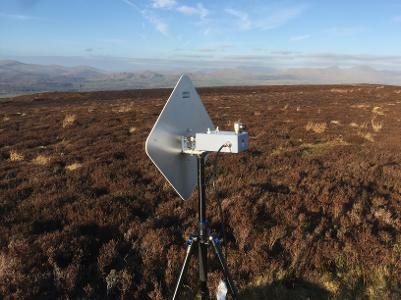 This new portable station is small enough to fit in a rucksack, including the panel antenna. I still power it from a 12v 10Ah battery, which adds the majority of weight, but give plenty of power for even the longest /p activation. Initial field tests have proved positive and a few QSOs have been made, including a couple from SOTA summit G/LD-049 where summit to summit QSOs have been had. Given this portable kit is a stripped back version of my main ATV station, but with ALL the same KEY elements I expect to be able to achieve similar results with distances of up to 180km.